Iraq's interim leaders are demanding input to a United Nations draft resolution, which will set out how much power a new Iraqi government will have. 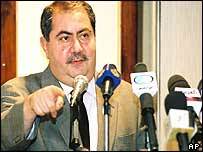 Iraqi Foreign Minister Hoshyar Zebari, speaking in New York, said he expected to "definitely" help shape the motion. Security Council members are set to discuss the US-UK plan on Thursday. Iraq's most influential Shia Muslim cleric has called on the newly chosen Iraqi government to press the Security Council for full sovereignty. Provides for a US-led multinational force, with authority to take all necessary measures for security. 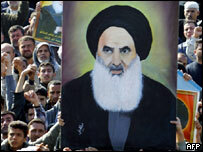 Grand Ayatollah Ali al-Sistani gave his cautious approval to the caretaker government but called on it to prove its efficiency. "The new government should get a clear resolution from the UN Security Council restoring sovereignty to Iraqis - a full and complete sovereignty in all its political, economic, military and security forms and endeavour to erase all traces of the occupation," Ayatollah Sistani said in a statement. The cleric wields enormous influence over Iraq's 60% Shia majority and correspondents say his approval is necessary to give the interim government legitimacy. Meanwhile, US Secretary of State Colin Powell said again that Iraq's new rulers would have no veto over US-led foreign forces. He said that while the new government would be sovereign, US and Iraqi troops would be under separate commands after the 30 June transfer of power. Mr Powell's comments contradict a recent statement by UK Prime Minister Tony Blair that individual operations would require the Iraqi government's consent. The BBC's Jon Leyne in Washington says Mr Powell's remarks were the clearest statement so far by the Americans about who is going to be in control of the military operations in Iraq. The draft gives a US-led multinational force authority to take all necessary measures for security but envisages a date for the end of its mandate when a fully elected Iraqi government is in place in January 2006. BBC News Online world affairs correspondent Paul Reynolds says this is being widely interpreted as meaning that the force would withdraw then, but it would be open to the elected government to ask some of the force to stay. Mr Zebari has already held talks with both the US ambassador to the UN John Negroponte and Britain's UN ambassador, Emyr Jones Parry, who hosted an evening gathering. He will meet all 15 council members on Thursday afternoon. "This is a very important resolution for us," the Iraqi foreign minister said. "And definitely we need to have our own input." He said it was "very odd for such an important resolution to be discussed in New York in the absence of Iraqi representatives", although he did not speak of what changes, if any, he would want to make. Mr Negroponte indicated that there were no drastic changes afoot, saying that the draft just needed some "fine tuning", and he was confident it would be adopted soon. "Full exercise of sovereignty will be restored to the people and government of Iraq by June 30. I don't have any doubt about that," he said. The resolution says the mandate of foreign troops in Iraq will end on "completion of the political process", possibly by the end of 2005. But French President Jacques Chirac said more work was needed on the text on affirming full sovereignty of Iraq's government, "notably in military matters". Russia and China, which along with France have a veto at the UN Security Council, have echoed his comments. China's UN Ambassador, Wang Guangya, said the restoration of "full sovereignty has not been fully reflected" in the text. "The cabinet is still seen as essentially Washington's creation"